But there's a free version of Forza 6 on the Windows Store. 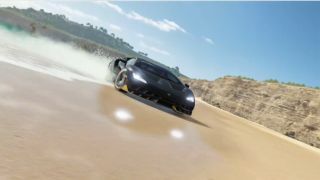 Very pretty racing game Forza Horizon 3 is releasing imminently, and your PC needs to be this good in order to play it. But what if you're straddling that 'minimum system requirements' line, and you want to be totally sure you'll be able to run it comfortably? Enter the 'demo', a radical new idea from Microsoft Studios, that will let you play a small portion of a game without paying anything. Good news: Microsoft has announced a demo for Forza Horizon 3. Bad news: while it came out yesterday on Xbox One, we'll have to wait until after launch for it to come to PC. Boo hiss etc, but Microsoft points the way to Forza Motorsport 6: Apex, a free, 'curated' version of its latest Forza Motorsport, for Windows 10. If you're not au fait with the Forza series, you're probably wondering what the difference between a Motorsport and a Horizon is. Well, Motorsport is the 'proper', simmy Forza, while Horizon is their more arcadey offering: extreme-sports-meets-tourism in an attractive open world. Forza Horizon 3 is coming to PC, via Windows 10, on September 27, thanks to Microsoft's new Play Anywhere initiative.